Pedestrian accidents can be especially horrific in terms of injuries. The human body is designed to withstand many bumps, knocks, and traumas, but when faced with two tons of metal at 25 to 60 miles per hour, the pedestrian doesn’t stand a chance. Pedestrian accidents often cause injuries such as broken bones, paralysis, brain injuries, coma and death. As an injured pedestrian, you deserve complete compensation for your injuries, lost wages, emotional suffering, and medical expenses. Our attorneys will work tirelessly to obtain the justice you deserve. Pedestrian accidents can occur nearly anywhere. Common places are in or near crosswalks, in residential areas, and near congested traffic areas like schools and shopping centers. Children may dash into the street, teens may fall into traffic or get pushed by a joking friend, or distracted drivers or walkers may disregard or fail to notice traffic signals or stop signs resulting in a pedestrian accident. When a pedestrian accident happens, the first thing an observer should do is secure the scene. This means extinguishing fires, placing running automobiles in park, and moving victims out of the roadway. If you are unable to move a victim, ask witnesses to help you block the flow of traffic to avoid further injury until the police arrive. While you are securing the scene, call 911 for help. Calling for help as soon as possible increases the chance of survival for all injured persons. Next, attempt to treat provide basic first aid. This includes putting pressure on bleeding wounds and beginning CPR is necessary. Have victims lie as still as possible and never move a pedestrian accident victim unless the area is unsafe. Moving a victim can cause further injury if not done in a special manner by trained medical personnel. If you have been involved in a pedestrian accident, always seek a medical evaluation, even if you are able to walk away from the scene with minor cuts and scrapes. A thorough medical examination can reveal any hidden injuries that may cause problems later on. Answer any questions presented by the police officer handling your accident, and try to be as thorough with the details as you can while the even is still fresh in your mind. If an on-site insurance adjuster arrives before you leave for the hospital, simply provide him or her with your contact information and do not answer any further questions about the accident. What Injuries Might Occur During a Pedestrian Accident? Most pedestrian accident victims will be unable to begin any documentation at the accident site. For this reason, you will need to rely on the documentation skills of first responders like police officers, paramedics, doctors, and nurses. Be sure to ask for the name of the police officer in charge of your accident if you are, as he or she will have access to most of the vital information you will need if you decide to file a personal injury lawsuit. It may be helpful for you to review the details of the accident as soon as possible to help cement them in your memory for later recall. Pedestrian accidents can happen anywhere. Without warning, a pedestrian accident can change the course of a life. 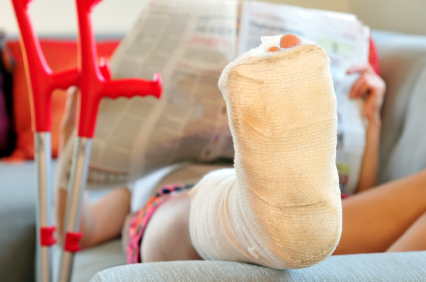 When someone else is responsible for your injuries, you deserve to receive restitution. Many individuals involved in a pedestrian accident file a personal injury lawsuit to help take back a portion of what the event cost them. If you or a loved one has been involved in a pedestrian accident, you may find these commonly asked questions and answers helpful. Q: Are there any traffic laws that apply to pedestrians? A: Yes. Pedestrians must obey many laws, such as observing traffic lights and crossing signs. Also, a pedestrian must use crosswalks and walk against the flow of traffic if forced to walk on a roadway. If sidewalks are provided, the pedestrian must use them instead of the roadway. Q: Is the driver of a motor vehicle always at fault if they strike a pedestrian? A: No. A driver is not always at fault in a pedestrian accident. However, many times fault can be proven under the law by showing negligence on the part of the diver. Q: Can I sue a property owner if I am injured while walking on private property, even if I did not have permission to be present? A: Perhaps. A valid case is determined by the specific details and requires individual examination on a case-by-case basis. Consult a skilled personal injury lawyer to review the details of your accident to verify if you have a valid personal injury claim. Q: Will my automobile insurance cover any of my injuries if I am involved in a pedestrian accident? A: Possibly. Many automobile insurance policies provide some coverage for pedestrian accidents. Check with your insurance agent to find out the details of your individual coverage. In the case of a hit and run accident, your injuries may be covered under the uninsured/underinsured motorist clause. Q: If an insurance agent shows up on the scene of the accident, should I give him or her a statement? A: No. Exchange contact information with the insurance representation and contact a personal injury lawyer as soon as possible to determine what statement should be provided to the insurance company. Q: What are some of the common injuries that occur as a result of a pedestrian accident? Q: Should I call the police department if I am involved in a pedestrian accident? A: Yes. Notifying the police is an important step in documenting your case should you decide to file a personal injury claim regarding your injuries. The documentation by police officers on the scene will help determine fault in your case.